09/15/2016 | Global Collaboration, News | Foley, M.
WAIMH sponsored 14 delegates as part of the WAIMH Sponsor a Delegate programme. The delegates represented an array of countries including India, Brazil, Ukraine and Ghana. 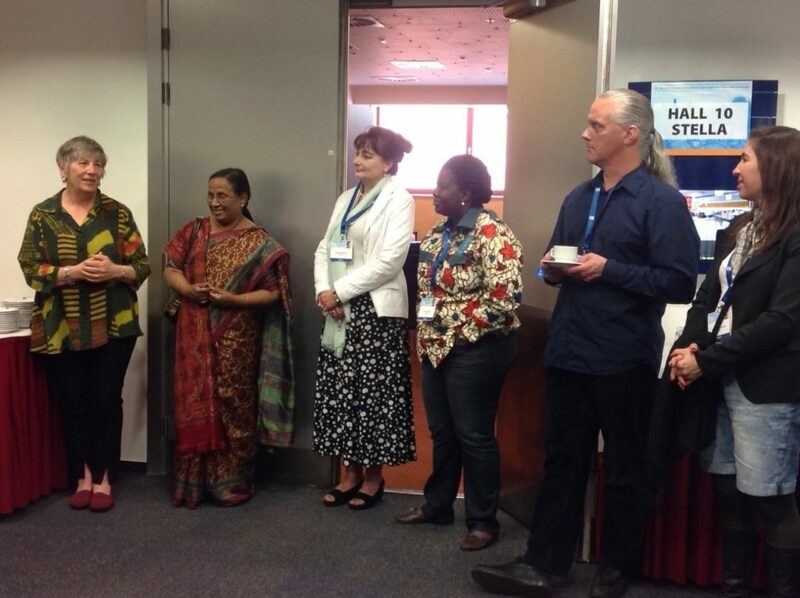 At the Congress, each sponsored delegate was welcomed by representatives of the WAIMH Board (Astrid Berg, Deborah Weatherston, Maree Foley and Anna Huber), the WAIMH Executive staff (Pälvi Kaukonen, Minna Sorsa), and the Editor of the Infant Mental Health Journal (Paul Spicer) at a welcome afternoon tea meeting generously supported by Wiley, Inc., the publishers of the Infant Mental Health Journal. 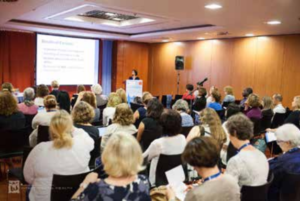 This meeting occurred after the pre-congress events and before the official opening of the congress and provided a space for delegates and WAIMH representatives to meet and get to know each other. New friendships and connections were carried through the congress days and. based on feedback from the delegates, will continue to grow from here on in. 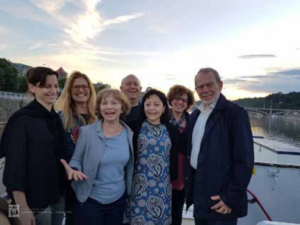 In addition, three sponsored delegates, Nana Gaisie (Ghana), Lívia Caetano da Silva Leão (Brazil) and Larissa Ramos da Silva (Brazil) have written about their experiences of being a WAIMH sponsored delegate and of attending the WAIMH Congress in Prague. These letters, copied below, collectively highlight the core of WAIMH that speaks of deep companionship as it nests in our internal worlds wherever we live and work in the field of infant mental health. Members of the Local Organising Committee. My dream revived that fateful day when I saw the ‘Sponsor a delegate’ session for persons from developing countries at the WAIMH Congress website. I am Nana Gaisie and I’m from Ghana. Though a medical doctor and a child development expert by profession, it would take a couple of months to conveniently raise funds to support my registration and accommodation for the whole duration of the conference (not to even mention the cost of the air ticket which was thankfully sponsored by the University of Haifa). The ‘sponsor a delegate’ package was therefore welcoming news that would bring great economic relief to my pocket. I quickly jumped at the opportunity which was based on ‘first come’ criterion. After a gruelling 4 months period of anxious waiting, I was greeted with the good news about how I had been awarded this sponsorship package, even with the option of choosing the hotel I wished to live in from a provided list. On the 28th June, I arrived in Prague not knowing what to expect as a first timer in a World Congress. I was chauffeured by a polite driver to the Hotel Olympik where I was supposed to reside for the next few days at no personal cost. After introducing myself to the receptionist and further attending to documentations, I found myself in the comfort of a very warm welcoming room, which is just what I needed after travelling for a total of 10 hours from Africa. My next worry was – ‘how do I get to the Clarion Congress Hotel from here?’ I soon discovered that I was in one of the few places in the world where the transport system is so user-friendly. I felt bursts of heat and nervousness rush through my spine occasionally at the mere thought of joining my team – Sagi Shwartz Avi, Oppenheim David, Sher-Censor Efrat and West Jane – to hold a workshop on Monday evening at the congress. At the Tea introduction meeting for the ‘sponsor a delegate’ recipients, however, all my anxieties waned by the warm welcome we received from Astrid, Deborah and the other members of WAIMH. I saw myself making friends and chatting away so comfortably whilst trying to take in the diverse professional backgrounds of my colleagues from low income countries present at that meeting. The euphoria was peaking by the time we gathered for the opening ceremony. The transport ticket for the entire duration of the congress which was part of the registration package was actually a pleasant surprise. I soon discovered that I was at home to many others from many other countries who love children as much as I do. Unfortunately, I met less than 5 people from my Africa out of about 1500 delegates. This woke me up to the fact that infant mental health, as important as it is, is not receiving the premium it deserves in Africa and other developing countries. Even though survival issues are more important in these areas, it is still of essence to consider the quality of life of the children who survive. As I interacted with other friends who had also received the sponsorship package, we all appreciated the fact that there was a lot of work to do in our home countries. I marvelled at the buffet of knowledge available to delegates, and the passion of the people presenting at every meeting I attended inspired me so much. The presentations I attended were so insightful, and the posters intriguing. I mused at how some of the presentations I would have loved to be at, had clashing times. But I still availed myself to learn as much as I could. For instance, the presentation about the involvement of dolphins in the assisted management of autism and other developmental problems in Israel was very revealing. I enjoyed looking around Prague as well after the congress. There is so much talk about the city of Prague and its beautiful architecture. The WAIMH experience gave me the opportunity to judge for myself the veracity of that statement. Prague, also known as Praha, is truly worth the talk. I reminisce the whole trip with joy and awe. It is an accepted fact that WAIMH 2016 was a success and even more so because professionals from low income earning countries and their children were thought of and given the much needed assistance to participate for the very first time in the history of WAIMH. Thanks to Astrid Berg who mooted the idea, and all who supported in one way or the other. After a period of hard work finishing my doctoral thesis (yay!) and after reading Nana’s beautiful testimony, now I can contribute with my views of the Congress. 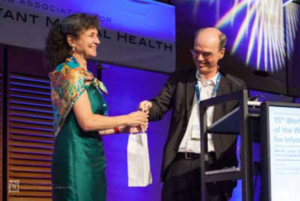 My first experience attending an international conference was in the 15th World Congress of the WAIMH, in Prague. I have been preparing myself for this huge opportunity since I heard about how amazing was this congress was that was held in Edinburgh, in 2014, and was dreaming about all the big researchers and clinicians I would meet and talk to about infant development. After dreaming, I knew a committee from the congress was organising to sponsor some researchers from countries like Brazil, and instantly I applied, hoping this could help me going to Prague. When I read the email confirming the sponsorship, I was so happy and amazed, and started to make plans about this journey, feeling opened for the new experiences to come. And I was surprised about what I have found there: brilliant and welcoming people from all over the world, sharing and being receptive to all the works presented in the congress. From that delicious tea offered by you, where I could feel a bit the feeling of being in the right place in the right time, to the final presentation where many of us could share the emotions with Miri and Ghassan. It was, so far, one of the best experiences in my life, where I confirmed my will of being a researcher and a professor, and also the love I feel for babies and families. I will never forget the feeling of being holding hands with all the 1500 people there, with the sentiment that many of us have been trying hard to make this world better with our work. I am so grateful for being part of this, and to Deborah, Astrid, and everybody from the committee who generously gave me and other colleagues the opportunity to have such marvellous help. I am sure I will attend the WAIMH Congress in 2018, in Rome, where I hope I can see again all these amazing people that inspired me so much. Thank you! Master Classes opened the mornings. Miri Keren stepped down as the President of WAIMH. The Programme Committee Chair Campbell Paul and Associate Executive Director of WAIMH, Kaija Puura. Dear members of the WAIMH direction and editors of the WAIMH “Perspectives” journal. I am sorry for taking so long to write this ‘thank you’ note. I read the e-mails about writing it and had no time until now to do so. I also want to let you know that, if you want to, it is ok with me if you publish this in the WAIMH journal. 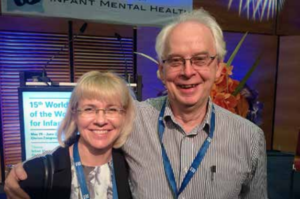 I am so grateful to WAIMH for having the Sponsor a Delegate programme, it is a great way of encouraging students and professionals in infant mental health all around to participate in an important event such as the WAIMH World Congress. Without the sponsorship, I would not be able to attend to the Congress. Being an undergraduate student, the experience of going to the Congress was immensely important to me, both academic and personally. I was very surprised to receive the sponsorship, and very thankful to you for also giving this opportunity to undergraduate students that are only beginning their journey as infant mental health professionals. It is a wonderful way to inspire young students as myself to continue to be involved with scientific research. 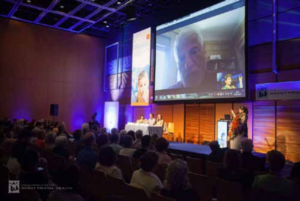 The Congress truly inspired me to continue learning with those who have experience in the field and to be a part of these events that bring people from the whole world together to discuss such an essential matter as infant mental health. I am very grateful to the staff members, who made my registration via internet and answered to all my doubts regarding the programme. They seemed very concerned about the well-being of all the people who received the sponsorship and they made us a very warm reception. I will never forget this experience and how I felt well received by the Congress and the staff.